Where can I buy Stocksmetic’s products? Stocksmetic’s products can be bought online on this website www.stocksmetic.com ; you have to create an account to go on with the order. Is the availability of goods shown on the website? Are the goods out of stock at the moment? If goods are out of stock at the moment, you can leave your email address; you’ll be notified as soon as the item is back in stock. Do you need a higher quantity of items compared to the one indicated on the website or do you want an offer for quantities higher than 5000 pieces? Contact our customer service and you’ll receive all information https://www.stocksmetic.com/int/contacts/. Which is the minimum and maximum order quantity? You can buy starting from 1 box and up to the quantity available in stock. The number of pieces per box changes according to the item; you can find the number of pieces per each box in the product page of the corresponding item. Is it possible to receive samples of the items? Yes, you can place a sample order by clicking on “Request a sample product” in each product page. If you want to order a complete pack (bottle/jar and suitable accessories), you have to select the sample of each component in the product page of each item. Is it possible to buy each single accessory (pump, ring, cap)? Yes, you can buy the single accessory; you have to enter section “Accessories” on the website; Stocksmetic does not guarantee the perfect compatibility with items combined with items other than the ones on our catalogue. What is the length of the pumps? The length of the dip tube of the pumps is defined according to the bottle you’re going to buy; if you just buy the pump, the length of the dip tube is the one indicated in the corresponding product page. How can I get all information concerning product features? There’s a product sheet for each item on our catalogue, and in box PRODUCT INFORMATION you’ll find all the technical details and the printable area. Is Stocksmetic’s packaging suitable for any other kind of product? Stocksmetic guarantees the functionality of the packaging, while compatibility tests are at customer’s charge. Goods are shipped from Italy. Approximate delivery times are around 3-5 working days from the date of receipt of payment; in case of shipments to USA or Canada, delivery times are about 10 working days. We can ship to Italy, Europe, USA and Canada with express courier TNT. Stocksmetic can delivery in parcels or pallet. You can select the delivery method that you prefer. If you choose the delivery on pallet, you have to be fully equipped for the unloading of goods; on the contrary, our courier reserves the right not to delivery. How can I check the status of my orders and shipments? You can check the status of the order directly in your account on our website, by selecting the corresponding order. We’ll send you an email every time that there is a status update, and we’ll communicate to you the tracking number of your shipment, as soon as the order leaves our warehouse; in case of pick-up of goods by our warehouse, we’ll give to you by email overall dimensions of your order, so that you can organize the pick-up with your courier. For any other information you can contact our customer service. Can I complete my pack with label and box, personalized with my graphic? Yes, with Stocksmetic you can now buy label and box to combine with the bottle or jar you’re buying. You can buy label and box in the product page of the bottle/jar or you can enter section “Labels and Boxes” and filter all the labels and boxes of your container, inserting its product code in the search field. You just have to select the finishing of paper and printing you’d like to buy and add the items to the cart. Where can I find the code of the bottle or jar to insert in section ''Boxes and labels''? 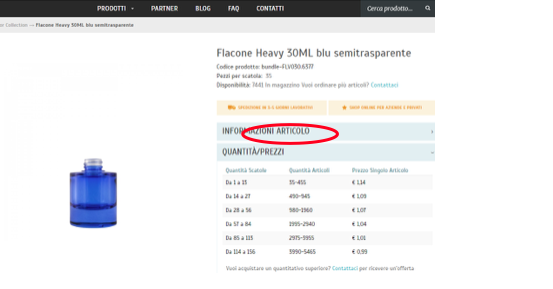 In the product page of the bottle or jar, you can find the article code, that will allow you to filter all suitable labels and boxes. Is the box suitable for all accessories combinations? Yes, the box of every bottle or jar is designed to adapt to all accessories combinations you’ll find in every product page. The MOQ is 100 pieces for each label or box. Do you charge a cost for the die cut? No, we don’t; Stocksmetic has realized die cuts for each item available on the website, and no other cost will be charged to the customer. What is the inner white flute card? It is an internal reinforced white flute cardboard, that can guarantee a higher protection to the glass packaging. All bottles and jars in glass will have this inner card. The cost of the inner is included in the price you see in the product page. How can I personalize boxes or labels? Insert the item in the card, conclude the order and go on with the payment. Download the file with instructions and layout for the uploading of your graphic; apply your graphic in the layout and upload your printing file directly in your account. Where can I find instructions layout and die cut layout? In each product page of labels and boxes, you can find Pdf instruction file with all information to prepare your printing file to upload in your printing area. In each page you’ll find also the file with die cut layout. You’ll also receive both files via mail. Where and when can I upload my graphic? As soon as we receive the payment of your order, we’ll start the uploading procedure of your graphic in our systems. You’ll receive an email with the die cutting layout to upload in your account. Will Stocksmetic check my printing file? Stocksmetic’s graphic department will only make a technical check, to verify if the file respects printing requirements; I case of problems, you’ll be contacted via mail. Stocksmetic won’t make typing check on printing files. Is it possible to receive pre-production samples? We do not realize pre-production samples, but you can buy here https://www.stocksmetic.com/en/kit-campionatura?sample=1 the sample kit in which you’ll see all the finishing for labels and boxes and touch with hand the quality of paper and printing. When will I receive my personalized product? You’ll receive your personalized product in about 5-6 working days, from the approval date of your graphic. We’ll send you an email as soon as our graphic department approves the graphic. You can check the status of your project in your account. Every update will be communicated to via email as well. Do you need help to create your graphic? Don’t you have a graphic? Don’t worry, our designer team will help you creating one! 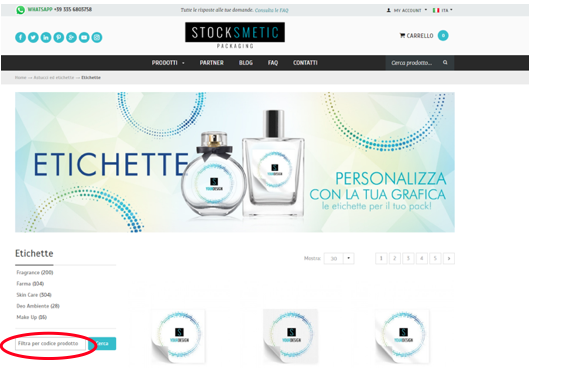 Contact us to receive an estimation from our customer service https://www.stocksmetic.com/int/contacts/. Contact our customer service for any information. How can I get in touch with Stocksmetic? We can accept the following payment methods: Visa, Mastercard, PayPal and bank transfer. How can I get the invoice and bill of lading of the ordered goods? You’ll receive the bill of lading of the ordered goods via email as soon as the order leaves our warehouse; you’ll find a paper copy of the document in the parcel and a Pdf copy in your account as well. Invoices will be issued at the end of each month; they will be sent via email and will be in your account as well.